Do the gates keep the unchosen out or the chosen in? The end of the world is near. Like Noah before him, Pioneer has been told of the imminent destruction of humanity. He says his chosen must arm themselves to fight off the unchosen people, who will surely seek refuge in the compound's underground fortress--the Silo. Lyla loves her family and friends, but given the choice, she prefers painting to target practice. And lately she'd rather think about a certain boy outside the compound than plan for married life in the Silo with Will. But with the end of days drawing near, she will have to pick up a gun, take a side, and let everyone know where she stands. ReviewGated is one of those books that had me instantly hooked. From Waco to Heaven's Gate cults have fascinated me for as long as I can remember. What makes this particular story so gripping is it is told from inside the community. Lyla is a teenage girl living in the gated community of Mandrodage Meadows. When Lyla starts to question their leader Pioneer things in Lyla's life become a lot more complicated. Now Lyla doesn't just need to worry about the end of the world but also whether she believes it will actually take place in the first place. First off, I want to just fangirl a little bit and say how much I loved this book. From the premise to the narration Gated was a complete win in my book. 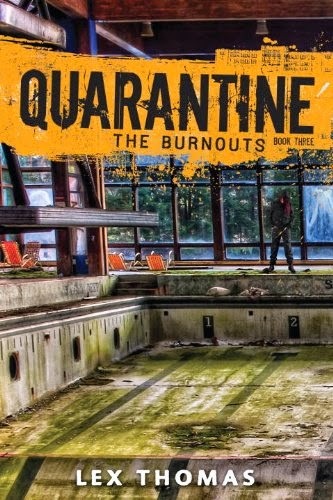 I have never really read a Young Adult book quite like this and found the Author was pretty spot on when describing how the parents and even Lyla herself were sucked in to the Prophet Pioneer's world. One of the best things about this book were the characters. I loved Lyla. I was expecting her to be the typical brainwashed fundamentalist type but instead found myself following this normally adjusted teenager who just happens to also be living in a cult. Lyla was spunky, smart and sympathetic. She loved her family but also understood that she's her own person with her own thoughts and feelings. You can really feel Lyla's internal conflict not only about Pioneer's teachings but the communities purpose in general. I also really liked Pioneer. I know it's odd saying I liked the cult leader but he was portrayed perfectly. In fact, I kept visualizing The Governor from The Walking Dead as Pioneer. On the surface he's sweet and charming but dig just a little under the surface and welcome to crazyland. Holy Hell how I wanted to throttle Pioneer most of the book but his sadistic yet suave nature is what made him the perfect villain. My only small issue with the whole story was the ending. I really, really expected things to go differently. I don't want to give why away because then I'd be ruining part of the story. However, I will say I always expected a certain character to show up in the end. The story makes such a big deal about never seeing inside Pioneer's office/home that I was so sure it was because he was hiding a very big secret inside. While the ending (until the last 3 pages) is satisfying enough as a stand alone, I do believe the Author leaves room for another book. In fact, I'm sort of hoping she does write one. I really cannot stress how much I would've liked to see a montage at the end. I would've loved hearing Lyla talk in voice over as we learn what happens immediately after the climax and then heading up to the ending that the book does have. Overall, Gated is probably one of my favorite books so far this year. I highly recommend picking this one up when it releases and giving it a go. 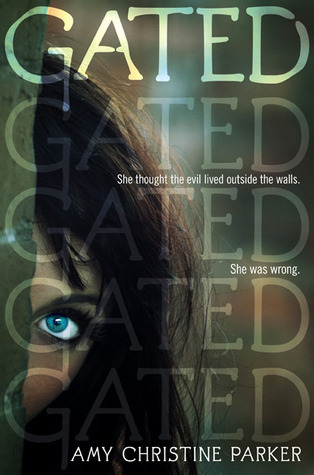 Gated is a With that being said, I will be rating Gated by Amy Christine Parker ★★★★★. Want to learn more about this book and the Author? Click the links below! Hmm. I've been skipping over this book because I hate the cover. Now you have me interested in it. It's funny I really like the cover. The book is definitely worth the read though. I'm fascinated by cults. I still remember that whole Waco/Branch Davidian thing. Crazy. I don't watch that show on the CW, though. There's only so much I can take. Have you read Drought by Pam Bachorz? It was probably the first book I read with a cult-like community in it. The cover is actually kind of similar to this one. I have not read that one but I'll check it out. What show on the CW? I don't turn to that channel often. Oh nice, I love fangirl-y reviews! I also love it when you get the chance to read a book that is unlike any book you have read before - such a great feeling! Lyla also sounds pretty awesome, but I think it's the villain that has me most interested - I love me a complex villain and they can be hard to find. This villain sounds perfect! Thanks for turning me on to this book, Kristin! I hadn't really heard anything about it before.